Okay that sounds a wee bit dramatic, I’ll give you that, but it’s really not. There’s an incredibly large number of people in this world who simply aren’t living their best life. That makes me super sad, and I think we actually think that maybe this is how life is supposed to feel…just okay. But I’m here to tell you that by living in your comfort zone, it is 100% killing your dreams. I think back to when I was a kid, and it blows my mind all the things I wanted for myself. And when I entered the adult world, it’s like I thought that those things weren’t for me anymore. Okay so maybe I’ll never be a ballerina or backup singer for Tom Jones (that last one is an adult dream). But just what if I can still make some big dreams a reality? And what if you can too?! How f*cking exciting is that thought?! That your dreams can actually be a possibility! Friend, it’s time to cut the crap. I really hate to tell you this, but frankly it needs to be said. And I know it needs to be said, because I’ve said it to myself: Get out of your own damn way! 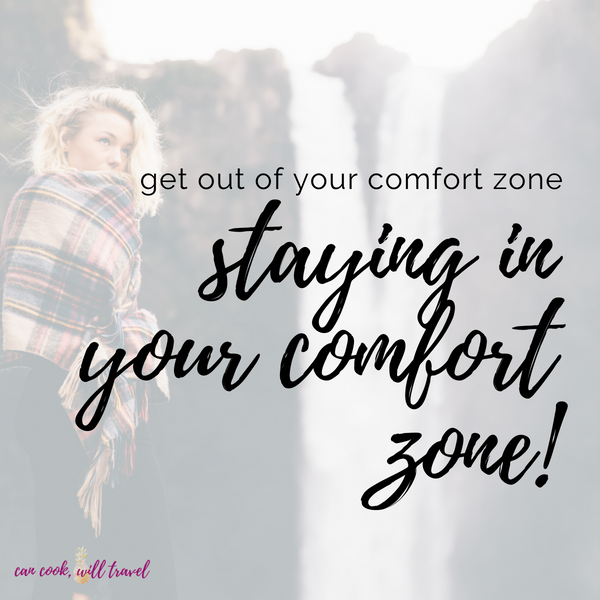 Seriously, when you accept your life is “comfortable”, then the idea of doing anything outside of this comfort zone is terrifying. But what if whatever lies outside of this zone could be completely life changing too? If there’s anything I’ve learned in my 30-some (yes, let’s keep it vague) years on this planet, it’s that all the good $#!t in life exists outside of your comfort zone. To think back on my biggest decisions and then wonder what if I’d not done them breaks my heart. 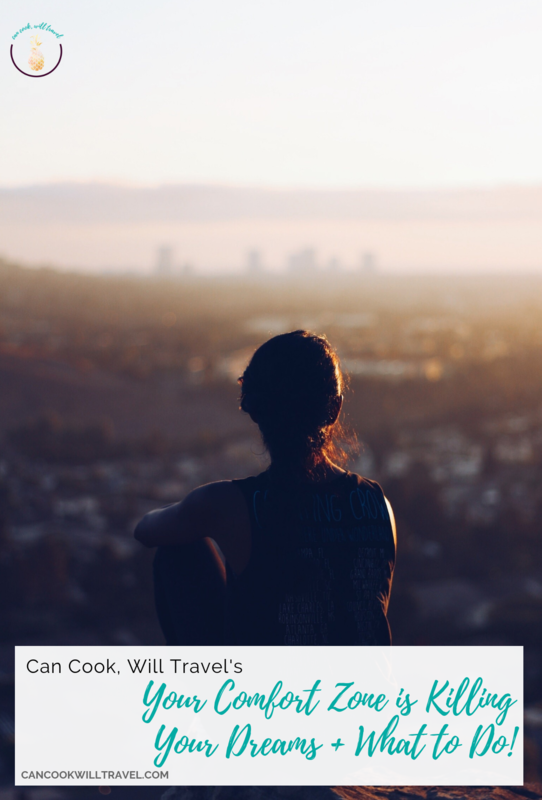 That would mean that I’d have missed out on the best friendships EVER, the chance to travel and see the world, to dig deep and find myself, and so much more. This past month I made a GIANT decision to start a new business, which I didn’t see coming. And I literally can’t explain in words how I went from 0 to 100 so fast, but I did. I think the best way to describe it is saying I asked myself what I had to lose versus what I had to gain. If the gains outweigh the losses, then my friend you’re doing yourself a disservice to ignore it. So I have a few words of wisdom to share. And frankly, they’re things I need to be reminded of on the regular too. 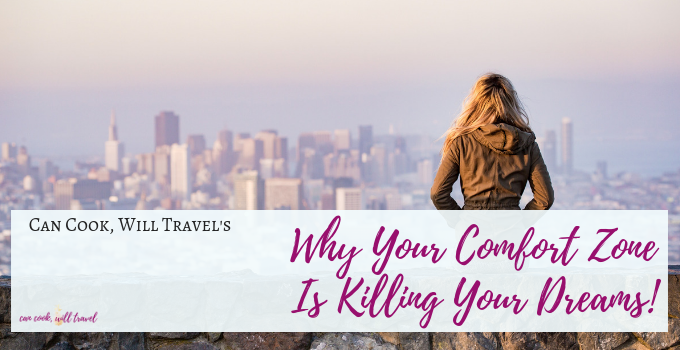 What happens if you stay in your comfort zone? Literally nothing will change. That’s what will happen, and if you’re cool with that, then that’s totally amazing! 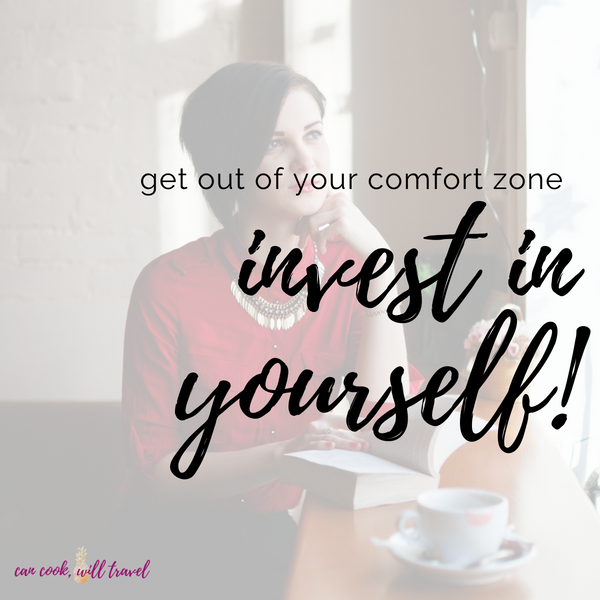 But if you’re not, and you’re wondering what else is out there for you, then your comfort zone has GOT to go! I was listening to the Often Ambitious podcast the other day, and a quote stuck out to me as I was driving. The woman they interviewed said: Nothing changes if nothing changes. You must take action to see the change. Let that sink in for a moment, because I had to let it do that for me as well. Nothing changes if nothing changes. That’s saying that if you accept your life as it is now, then don’t expect anything different. And if you’re dreaming of so much more for yourself, but you don’t change the variables, those dreams will float away. You must take action to see the change is also so powerful! If you dream of that promotion, degree, career change, financial freedom, losing that weight, finding Mr. (or Ms.) Right, then action is imperative. For me, it’s definitely financial freedom, because I’ve been a slave to my debt for far too long. And I’m frankly worn out from living in apartment after apartment with no place to call my real home. Don’t delay, because then you’ll be 30-, 40-, or 50-something or more, wondering why X, Y, & Z didn’t happen. News flash: It’s because you didn’t go after it. Or if you did, or thought you did, you didn’t go after it quite as hard as you could have. When is the last time you went for something but half-assed it? I’ve done it SO many times with everything from a relationship to a side hustle to taking control of my finances. And I want so badly for you to go after your dreams, but you really need to start now. We’re all guilty of “waiting for the perfect time” or “needing X, Y & Z to get done first” or “waiting until your next paycheck comes in”. Stop the waiting and biding your time. When you look back at your life, you’re not going to regret the risks you took. But you will regret the risks you didn’t take, because those will always leave you with doubt. So if you want to lose that weight, commit to it and do something different than what you have done before. Change is good, and your body loves change. (It’s actually your brain that’s terrified of it.) Or if you want that financial freedom, then think about ways to increase your income. Action Step: Make a game plan right now, and decide what is one thing you can do RIGHT NOW to get you closer to that dream. For my desire for financial freedom it was finding another stream of revenue, so I found a company I truly believed in to partner with in my spare time. And so far it’s feeling like the best decision I’ve done in years! Sorry to tell you this, but you’re actually amazing, talented, unique, and beautiful. Yep, you! Look in the mirror and don’t stop looking until you start to believe this! Here’s the thing that’s true with any new challenge we face: we are our own worst enemies. We’re completely capable of doing the work it takes to get there, but our mind starts telling us we’re not. But we’re meant for more. That’s why we’re on this planet and living this life is so we can grow and be happy! You’re not born to live a humdrum, miserable life, so drop that idea right now. You were born to be amazing, to learn how to be your best self, and to lead with love. Action Step: Get in front of that mirror and look deep into you beautiful eyes and tell yourself: I’m worthy. I’m amazing. I’m capable of doing big things. This exercise each day is so powerful and will rewire your brain to drown out the fearful thoughts. Another amazing tool to use to drown out the noise in your head is personal development. Now I know it gets a weird stigma, but it’s mission critical! The fact is the if you want big things, you have to invest time and energy into whatever you’re working on. But it’s also just as important to invest in YOU. And there’s no surer way to get out of your comfort zone than by reading/listening/learning from people who’ve already done it. Another amazing way to invest in yourself is to take care of your health. Hey that almost rhymed, so that’s fun! But seriously whether it’s exercise, eating right, getting a massage or a mani/pedi, or going on vacation, they all count. These are all great ways to take care of your mind, body, and soul. Action Step: What are 2 things you can start doing right now to invest in yourself? Even better is to make one a health goal and one a learning goal. If you don’t like to read, then find great podcasts to listen to! My favorite ways to invest in myself are: going on walks, cooking healthy meals at home, meditating, going to my esthetician, reading, journaling, and learning. The final piece is the most fun one, because it makes you channel your inner child. It’s to dream and dream BIG! Why is this so important? So glad you asked! 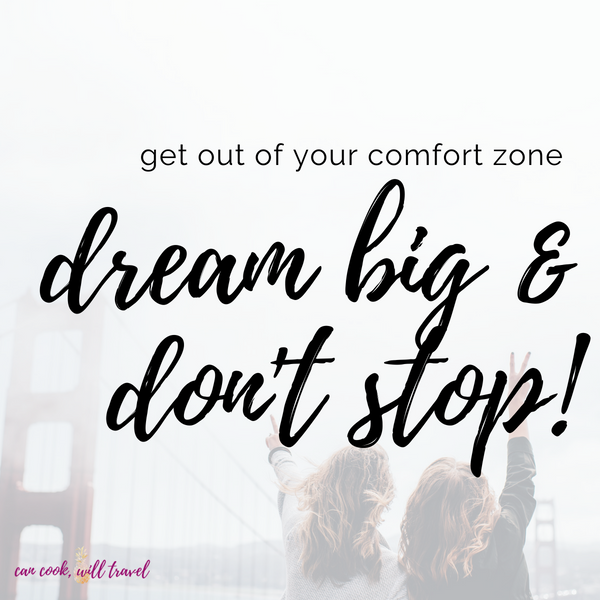 Discovering and reminding yourself of big dreams helps you to stay motivated and remember why you want to get outside of your comfort zone. If you have things you want enough, then they will keep you from just dipping a toe into a new place. 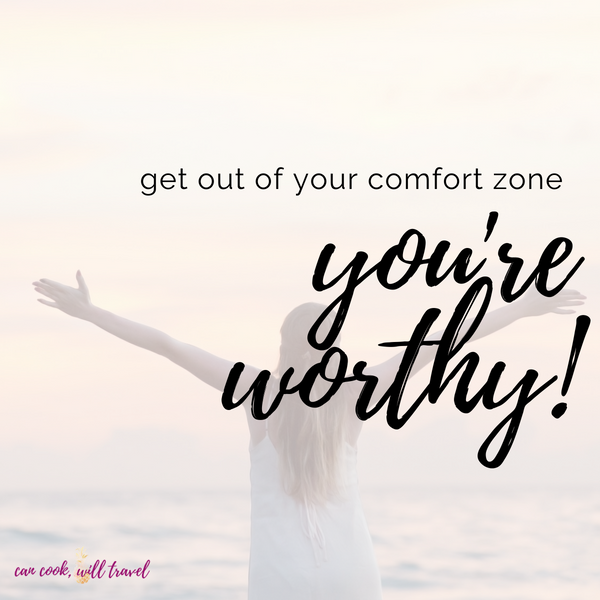 Instead you’ll be flinging your body out of your comfort zone and into a challenge, because you have set some big, inspiring goals. And don’t ever stop dreaming, because it will keep you energized and looking forward in life. The worst thing you can do is look backwards at your life with regrets. Oh no, my friend, look at the present and future and know that it’s in your hands. Action Step: Name 2 big dreams that you’d love to accomplish. And then really think about them or even journal on them until you know which one is most important to you. Then go pursue that dream with everything you’ve got. I don’t care how tired you are or impossible it feels, because it’s all in your head. My big dreams are to be financially free so I’m also debt free and able to afford amazing trips, a home, a new car, etc. And guess what?! That company I partnered with is an amazing opportunity to do just that. Not only can I make money to pay down debt and save for a home, but they also let you earn free trips and a car. How freaking exciting is that?! No matter who you are or where you’re at in life, you have to know that you’ve got this! You’re still breathing and living and miracles happen every day. So why the hell can’t they happen to you?! There’s literally NO reason that you can’t get to where you want no matter your age, size, bank account, etc. If you’re reading this, then you’re blessed with technology, which is an incredibly powerful tool to help you expand your influence. So go forth, kick your comfort zone to the curb, and take chances! You won’t regret it! 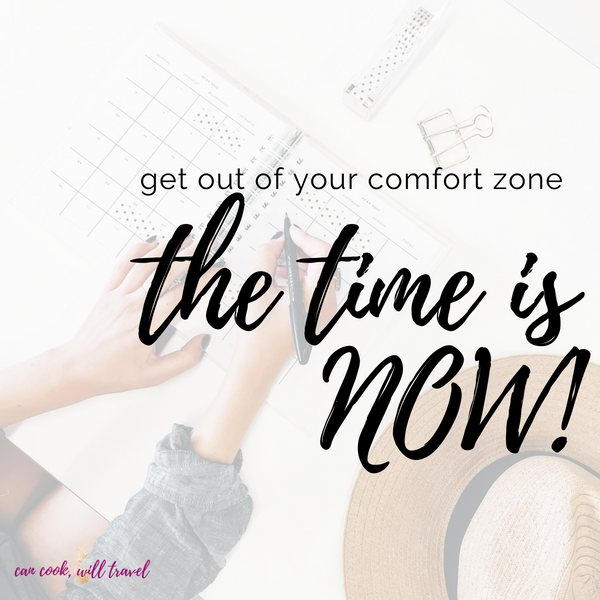 When’s the last time you got out of your comfort zone and took a chance on yourself? Mine is this new hair care adventure, and before that it was my blog, and a big move, and the list goes on and on. Remember the time is now! Stay inspired & dream big!